No nursery is complete without a plush rocking chair, and the Emma Nursery Rocking Chair from Delta Children is the perfect addition to your baby's space. 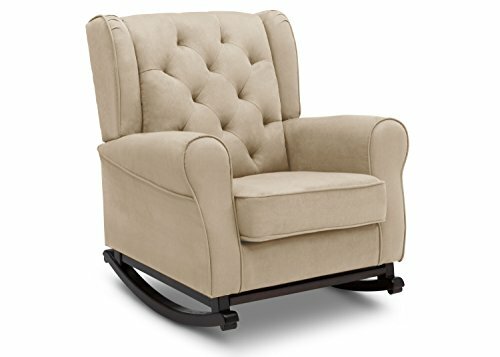 Crafted to comfort tired babies and parents, this chair features a thickly padded seat cushion and armrests, plus it sits above wood rocker feet that create a smooth swaying motion. Its classic wingback silhouette, tufted accents, microfiber upholstery and dark chocolate finish on the wood feet allow for it feel right at home in a nursery, living room or any shared space that needs a cozy spot. Delta Children was founded around the idea of making safe, high-quality children's furniture affordable for all families. They know there's nothing more important than safety when it comes your child's space. That's why all Delta Children products are built with long-lasing materials to ensure they stand up to years of jumping and playing. Plus, they are rigorously tested to meet or exceed all industry safety standards. If you have any questions about this product by Delta Furniture, contact us by completing and submitting the form below. If you are looking for a specif part number, please include it with your message.